Lake Odessa, MI – (July 31, 2015) – Often times a driver’s ability to navigate through slower traffic can win or lose a race. Dustin Daggett proved that to be true on Saturday night taking the lead from Chase Ridenour in slower traffic and then holding off a late race surge by Gregg Dalman to win the Engine Pro Sprints on Dirt presented by ARP feature at I-96 Speedway. Daggett’s drove to the Mott Motorsports car to his 101st in Sprints on Dirt competition. Ridenour and Brett Mann started on the front row for the 25-lap feature. Ridenour took the lead early with Kyle Pitts and Daggett in pursuit. Following a restart on lap three Daggett overtook Pitts for second and set out after Ridenour for the lead. Daggett closed as the duo ran up on slower traffic. Then on lap 11 Ridenour made contact with a slower car going into turn one, allowing Daggett to ride the rim into the lead. Two more cautions on lap 12 and 15 allowed Gregg Dalman to work the bottom of the race track and move into the runner up spot. Following the final restart Dalman chipped away at Daggett’s lead, eventually running side by side for several laps until getting boxed in on the bottom by slower traffic. This allowed Daggett to pull ahead over the final five laps to claim the victory. Dalman held on for second while Pitts passed Ridenour for the final podium position. Craig Karazim rounded out the top five. Heat race events for the 21 car field were won by Daggett, Ridenour, and Trey Smith. 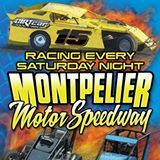 The Engine Pro Sprints on Dirt presented by ARP series continues Saturday night at the Montpelier Motor Speedway. Engine Pro Feature (25 Laps): 1. 2M – Dustin Daggett, 2. 49T – Gregg Dalman, 3. 7K – Kyle Pitts, 4. 11R – Chase Ridenour, 5. 4 – Craig Karazim, 6. 19 – Brett Mann, 7. 10S – Jay Steinebach, 8. 31 – Andy Teuenssen, 9. 27 – Brad Lamberson, 10. 27R – Kyle Locke, 11. 84 – Kyle Poortenga, 12. 20A – Andy Chehowski, 13. 11 – Trey Smith, 14. 21T – Troy Chehowski, 15. 1A – Mark Aldrich, 16. 23G – Joe Geibe, 17. 70 – Jim Lingar, 18. 19J – Linden Jones, 19. 21 – Matt Lumbert, 20. 27J – Jared Lamberson, 21. 89 – Chris Pobanz. DNS: 24 – Eric Smith. The Engine Pro Sprints on Dirt presented by ARP series will visit two different states for a doubleheader this weekend. On Friday, July 31st, SOD makes its final appearance of the season at I-96 Speedway in Lake Odessa, Michigan. SOD’s first action packed appearance on May 1st saw Dustin Daggett jump into an early lead only to tangle with another car on lap 14 and go to the tail. Ryan Ruhl picked up the win followed by Gregg Dalman while Daggett worked his way back through traffic and finished 3rd. Pit Gates open at 4pm and Grand Stands open at 5:30pm. Hot laps start at 6:30pm and racing starts at 8:00pm. Pit passes are $25.00; grand stand tickets run $8.00 for seniors 60 and over, $12.00 for adults, $6.00 for kids 6-12 and kids under 5 are free. Family passes (including 2 adults and 2 kids) are $30. On Saturday, August 1st, the Engine Pro Sprints on Dirt presented by ARP will head south for their final appearance this year with the K&L Ready Mix NRA Sprint Invaders at Montpelier Motor Speedway in Montpelier, Indiana. The co-sanctioned event will feature a truly epic battle drawing Ohio’s and Michigan’s finest winged sprint car drivers to the Indiana ¼ mile bullring. The first appearance of SOD & NRA on June 6th saw Jared Horstman pick up his first MMS win over SOD heavy hitter Dustin Daggett, Max Stambaugh, Hud Horton and Randy Hannagan. Racing action starts at 6:30pm with gates opening at 3:00pm and hot laps at 5:00pm. General admission tickets are $15.00 with kids (12 and under) free. Pit passes are $30.00. The 36th season of competition for the winged sprint car series has started out strong in 2015 with five different drivers picking up wins in six completed events to-date. For more information, please go to the official series website, www.sprintsondirt.com. 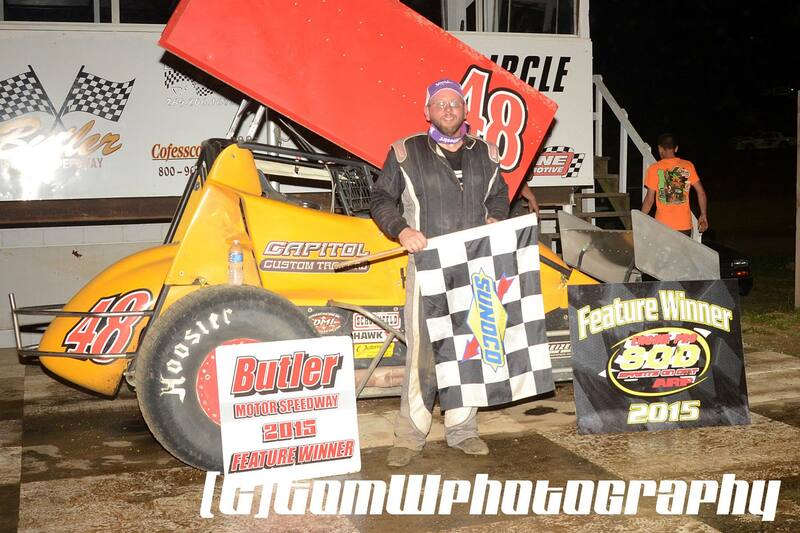 Quincy, MI – (July 25, 2015) – Ryan Ruhl and Kevin Atkins won feature events Saturday night with the Engine Pro Sprints on Dirt presented by ARP at Butler Speedway. Ruhl won the makeup feature that was rain delayed from June 13th while Atkins won the regularly scheduled SOD main event. In the makeup feature Ruhl started on the front row and led all 25-laps in route to victory, holding off multiple challenges from Chase Ridenour for the victory. In the regularly scheduled feature Linden Jones led a majority of the feature until getting tangled up with a slower car on lap 17. This gave Atkins the lead he would never relinquish. Makeup Feature: 1. 16 – Ryan Ruhl, 2. 11R – Chase Ridenour, 3. 2M – Dustin Daggett, 4. 27 – Brad Lamberson, 5. 1A – Mark Aldrich, 6. 10J – Chris Jones, 7. 7K – Kyle Pitts, 8. 48 – Kevin Atkins, 9. 25M – Ken Mackey, 10. 49T – Gregg Dalman, 11. 4 – Craig Karazim, 12. 21T – Troy Chehowski, 13. 77 – Zane DeVault, 14. 19 – Brett Mann, 15. 27J – Jared Lamberson, 16. 10S – Jay Steinebach, 17. 19J – Linden Jones, 18. 24 – Eric Smith. Comp Cams / Late Automotive Heat Race #1 (8 Laps): 1. 27 – Brad Lamberson, 2. 20A – Andy Chehowski, 3. 27K – Ryan Kirkendall, 4. 19 – Brett Mann, 5. 24 – Eric Smith, 6. 70 – Jim Lingar. DNS: 27J – Jared Lamberson. Kistler Racing Products Heat Race #2 (8 Laps): 1. 49T – Gregg Dalman, 2. 48 – Kevin Atkins, 3. 2M – Dustin Daggett, 4. 23G – Joe Geibe, 5. 21T – Troy Chehowski, 6. 25M – Ken Mackey, 7. 2T – Ralph Brakenberry. Engine Pro B-Main (10 Laps): 1. 11R – Chase Ridenour, 2. 84, 3. 21T – Troy Chehowski, 4. 10J – Chris Jones, 5. 25M – Ken Mackey, 6. 24 – Eric Smith, 7. 70 – Jim Lingar, 8. 27R – Kyle Locke, 9. 6 – Tyler Beardon, 10. 2T – Ralph Brakenberry. DNS: 27J – Jared Lamberson. Feature (25 Laps): 1. 48 – Kevin Atikins, 2. 20A – Andy Chehowski, 3. 49T – Gregg Dalman, 4. 16 – Ryan Ruhl, 5. 2M – Dustin Daggett, 6. 27 – Brad Lamberson, 7. 46 – Robert Huisken, 8. 4 – Craig Karazim, 9. 27K – Ryan Kirkendall, 10. 1A – Mark Aldrich, 11. 10S – Jay Steinebach, 12. 21T – Troy Chehowski, 13. 11R – Chase Ridenour, 14. 77 – Zane DeVault, 15. 7K – Kyle Pitts, 16. 19J – Linden Jones, 17. 84 – Kyle Portenga, 18. 23G – Joe Geibe, 19. 19 – Brett Mann, 20. 10J – Chris Jones. 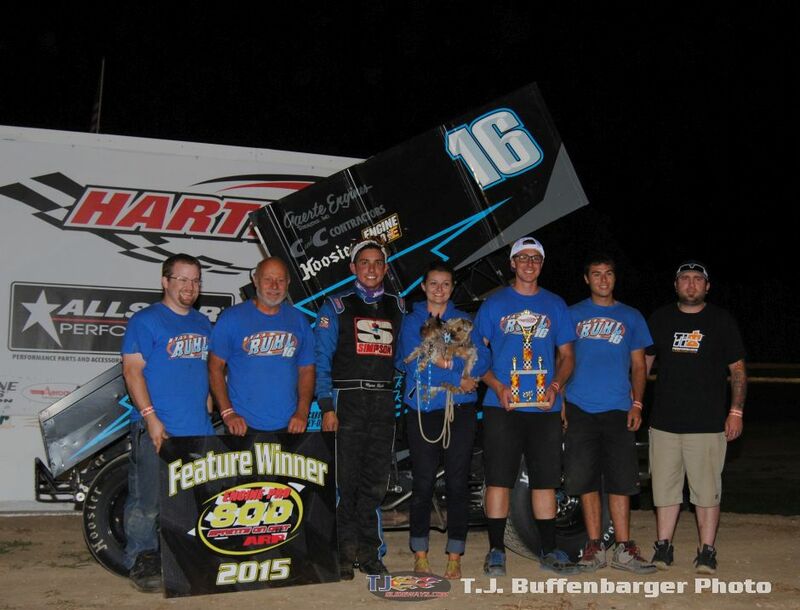 Hartford, MI – (July 24, 2015) – Ryan Ruhl held on through two late race restarts to win the King of Michigan event Friday night with the Engine Pro Sprints on Dirt presented by ARP. Ruhl passed Dustin Daggett on lap ten and never looked back to claim his first King of Michigan crown. Andy Teunessen and Craig Karazim started on the front row for the 25-lap feature. Karazim led through two corners before Daggett slid under him coming off turn four. After starting eighth Ruhl quickly worked his way into the top three on the opening lap, sliding by Karazim for second and started to run down Daggett. Daggett and Ruhl raced through slower traffic when Daggett got caught behind a slower car on the bottom side of the race track. Ruhl went around that same car on the top and used his momentum topo power by with a slide job in turn four to take the lead. Other than one close call that nearly resulted in spinning out Ruhl dominated the remainder of the event. Late race cautions for Nic Rogers slowing on the front stretch and a wild ride by Craig Karazim over the wall in turn two without turning over did not stop Ruhl from winning over Daggett, Teuenssen, Trey Smith, and Gregg Dalman. Comp Cams / Late Automotive Heat Race #1 (8 Laps): 1. 49T – Gregg Dalman, 2. 11 – Trey Smith, 3. 31 – Andy Teunessen, 4. 23G – Joe Geibe, 5. 7K – Kyle Pitts, 6. 20A – Andy Chehowski, 7. 70 – Jim Lingar. Kistler Racing Products Heat Race #2 (8 Laps): 1. 16 – Ryan Ruhl, 2. 2M – Dustin Daggett, 3. 22OZ – Aaron Shaffer, 4. 7 – Nic Rogers, 5. 19 – Brett Mann, 6. 24 – Eric Smth, 7. 51 – Oscar Smith. Allstar Performance / Engler Machine and Tool Heat Race #3 (8 Laps): 1. 11R – Chase Ridenour, 2. 4 – Craig Karazim, 3. 77 – Zane DeVault, 4. 19J – Linden Jones, 5. 27 – Brad Lamberson, 6. 18 – D.J. Lamance. Engine Pro Feature (25 Laps): 1. 16 – Ryan Ruhl, 2. 2M – Dustin Daggett, 3. 31 – Andy Teunessen, 4. 11 – Trey Smith, 5. 49T – Gregg Dalman, 6. 7K – Kyle Pitts, 7. 11R – Chase Ridenour, 8. 77 – Zane DeVault, 9. 23G – Joe Geibe, 10. 20A – Andy Chehowski, 11. 19J – Linden Jones, 12. 70 – Jim Lingar, 13. 7 – Nic Rogers, 14. 22OZ – Aaron Shaffer, 15. 4 – Craig Karazim, 16. 19 – Brett Mann, 17. 51 – Oscar Smith, 18. 27 – Brad Lamberson, 19. 18 – D.J. Lamance, 20. 24 – Eric Smith. The Engine Pro Sprints on Dirt presented by ARP series will visit two Michigan tracks this weekend for a thrilling doubleheader. On Friday, July 24th, Hartford Speedway puts a twist on the King of Michigan by pairing up the Engine Pro Sprints on Dirt presented by ARP with the UNOH All Star Circuit of Champions for an epic night of racing on the Wicked Half Mile. 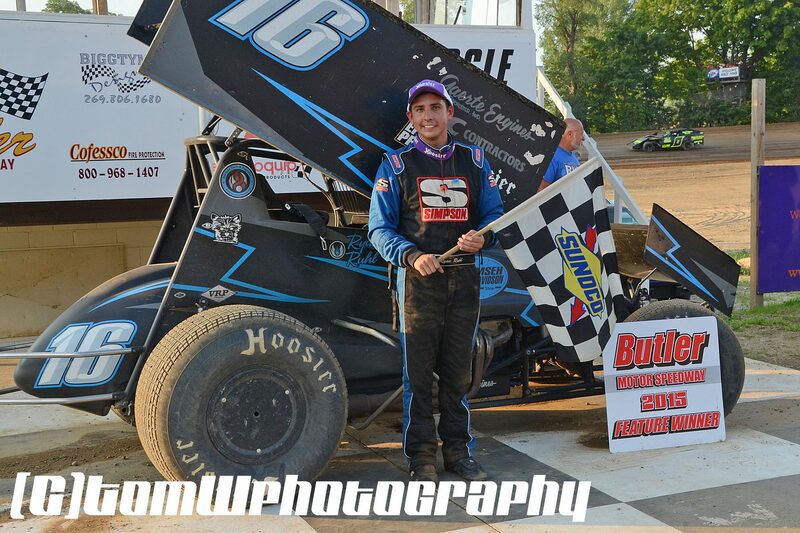 The June appearance of SOD at Hartford Speedway saw Dustin Daggett pick up his 100th SOD victory after a ferocious battle with Ryan Ruhl. Gates open at 5:00pm with Hot Laps at 7:00pm and Racing at 8:00pm. General admission tickets are $25 (kids 10 & under are free with paying adult) and pit passes are $30. On Saturday, July 25th, Butler Speedway will host the Engine Pro Sprints on Dirt presented by ARP for the 2015 Sprint Car Spectacular. The action-packed show at the Butler Battlegrounds will include a make-up feature from the rained out June 13th show as well as a full regular program. 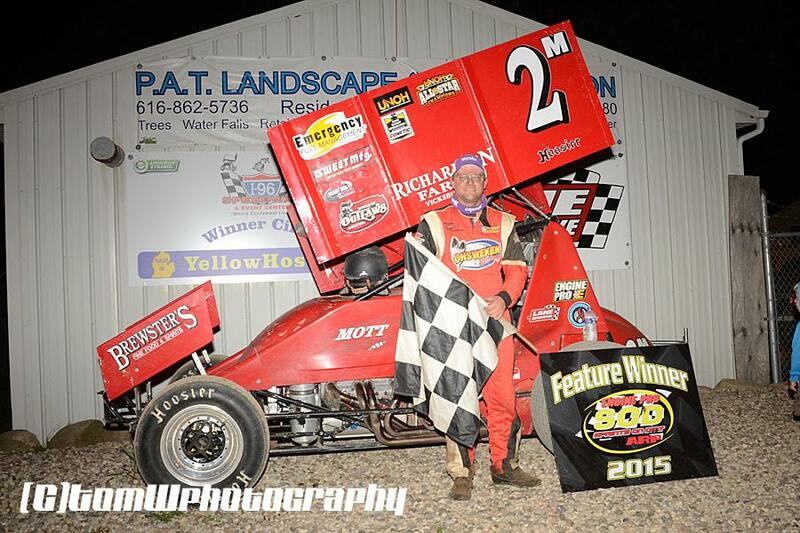 The 2014 season saw Jared Horstman and Randy Hannagan picking up SOD wins at Butler Speedway. Gates open at 4:00pm with Hot Laps at 6:00pm and Racing at 7:30pm. General admission is $15 for adults, $12 for seniors and $7 for kids 6-12. Kids 5 and under are free. Pit passes are $25.00. The 36th season of competition for the winged sprint car series continues to build momentum in 2015 with nine different drivers picking up wins in thirteen completed events to-date. For more information, please go to the official series website, www.sprintsondirt.com.